My husband bought me several fun tshirts awhile back. One is this That Girl tee … I assume he thinks I am “That Girl” and who knows what he means by that! Ha! I found it here and I also linked other cute graphic tees. I’ve always heard how fabulous Frye boots are … such good quality and comfortable too. This is my first pair and I couldn’t wait to wear them, but … my heels slip out when I walk. Argh! I tried putting in little heel pads, but they just curled up and came out the first day. Does anyone have any ideas for me? Do you have Frye boots and do you love them? I want them to be super comfortable because they look so cool! I decided that I needed another pair of Frame denim since I wear my tulip hem pair all the time. I’m a big fan of the cropped flare trend, something that I know not everyone gets excited about. When I saw this pair on sale for 60% the regular price on the Nordstrom Rack website, I couldn’t resist of course! If you follow me on Instastories and Facebook, you’ll already seen this bag and know how much I love it! 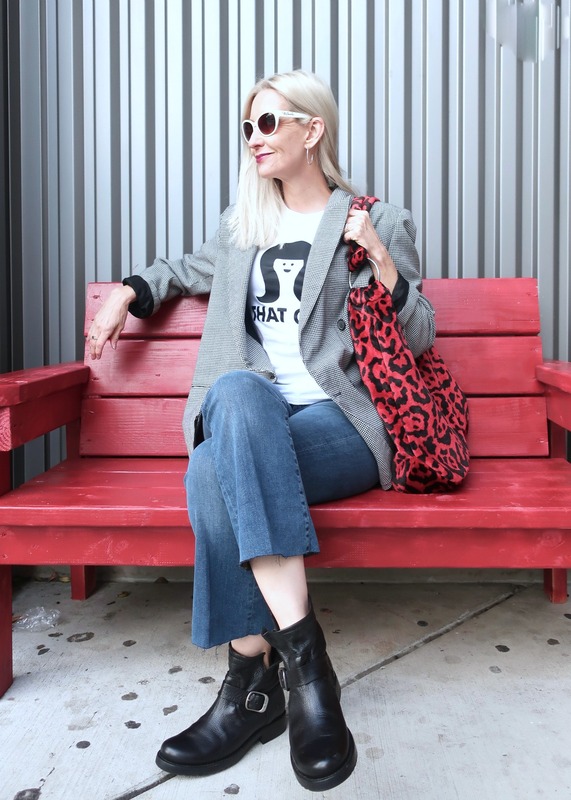 Colored leopard is really hot right now and I’m crazy about this fun, fuzzy, red leopard tote bag. A plaid blazer is a classic that’s having a big moment right now. And if you don’t already have one, it’s the perfect time to add on to your wardrobe: many are on sale and I’m sure it’s a piece you’ll be wearing for years to come. This oversized blazed I’m wearing here is a vintage thrift store find, complete with 80’s shoulder pads! If you want something less funky and more wearable, I’ll linked up some great choices below. Speaking of a funky addition to some classic pieces, did you see this outfit? Also, if you haven’t yet, be sure to sign up for the Fashion Should Be Fun newsletter, full of behind the scenes chit chat and email access to fashion advice from yours truly. I’ve gotten a couple super nice emails this week and it’s so fun to have my readers reach out with questions and ideas! I am really lusting after a pair of cropped flares! 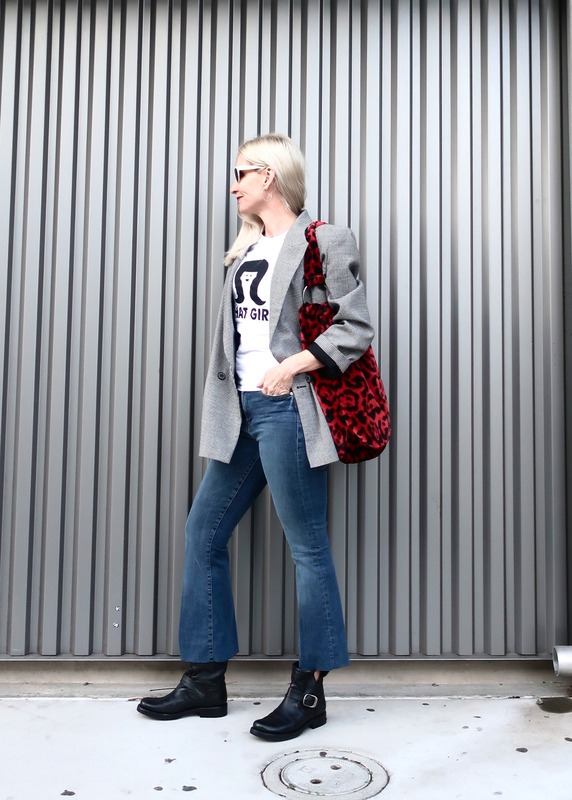 I love the way this came together and that graphic tee is fab! I wish they would look good on me! Hope to see you on my Fancy Friday link up party! Hi Dawn- I just got my first pair of Frye boots too! Mine are knee height and this very gorgeously aged brown color. I bought mine a half size down and wear them with socks that have a little cushion and they’re perfect. Maybe thicker socks will help you too? Great idea, Gabby! I have thick socks to wear with ski boots (though it’s been awhile since I hit the slopes!) … Let me try that! Thanks!! 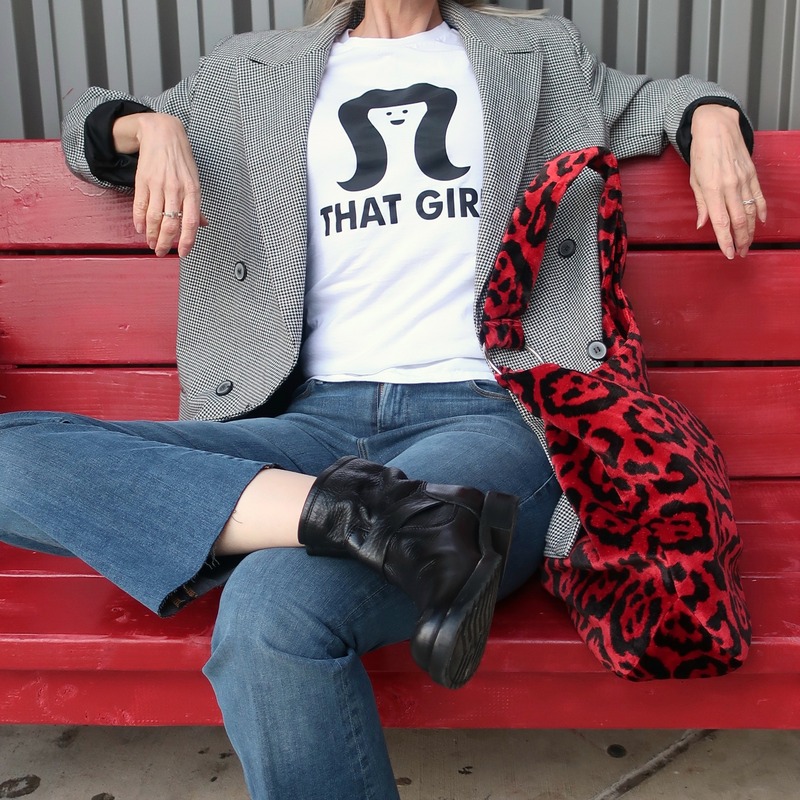 What size did you get in the “That Girl” tshirt”? I’m ordering one! Yay! You have to let me know when you get it! I got the SMALL and it’s … small! If you’re between sizes, size up one size! Really enjoying the newsletter, Dawn Lucy. Well done! I finally ordered the That Girl tee, only the scoop necked version. I can’t wait to get it! I loved that show so much when I was growing up! You always feature such fun items! Fashion CAN be fun! Cant wait to see you wear it!